The Ray Mears Campfire Tripod is the latest addition to the Ray Mears range of outdoor cooking equipment. 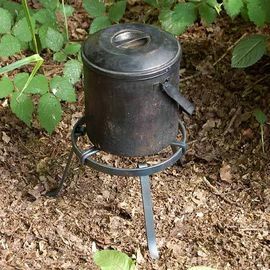 Designed by Ray Mears and hand-made by British blacksmith Andrew Kirkham, this sturdy tripod features a height-adjustable hook for hanging your pots, billy cans and dutch ovens over your campfire. The Ray Mears Campfire Tripod is an extremely tough piece of kit designed specifically for use in the outdoors. 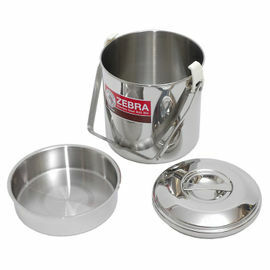 It is ideal for use when camping in a group and travelling by car. As with all of the items in the Ray Mears Cooking range, this is a piece of kit that will see it through many trips and adventures. It features spiked feet to improve safety and stability. 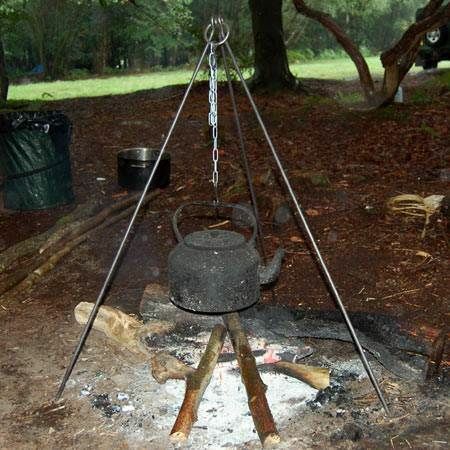 Even whilst cooking, the height of your billy can or pot can be raised or lowered accordingly, simply by raising the chain and attaching it to a second hook at the apex of the tripod. 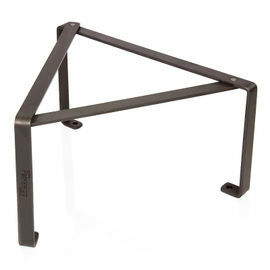 The tripod itself is made from self-coloured natural steel; non-treated, it will blacken with use. 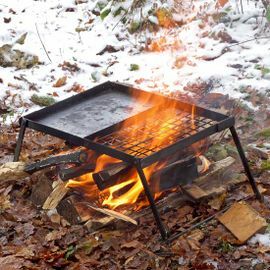 Andrew Kirkham is an esteemed British blacksmith who has produced a number of items for Ray and Woodlore over the years, including our Steel Strikers and Folding Trivets. We are very happy to be working with Andrew on this product and have nothing but praise for his exceptional work. Height when assembled: 110 cm approx. Length of chain: 68 cm approx. Ray Mears Campfire Tripod is rated 5/5 based on 3 customer reviews. Really nicely made and obviously made to last. I have used it several times already. 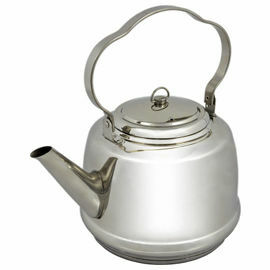 Apart from hanging cookware, I have also used it for spit roasting. Recently I fashioned a simple wire cradle to hold a spit which hangs from the tripod hook over the fire. 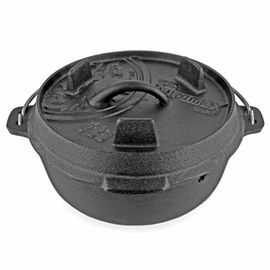 The chain and hooks allow for easy temperature control as your fire burns down. I have yet to use this fully in the field but I am very pleased with the build quality. It's not an item that I will be using a lot but I believe, over time, this will prove to have been a very worthwhile purchase. Quality kit which will easily outlast me!